People with links to Monsanto, Syngenta and Dow evaluate the safety of the GMOs submitted for approval by these same companies. In 2013, 24.4 million hectares of GM crops were grown in Argentina – mostly soy, maize and cotton. In 2013, 24.4 million hectares of GM crops were grown in Argentina – mostly soy, maize and cotton. The public health consequences of GMO cultivation in Argentina have been extensively publicized, with cancer and birth defects skyrocketing in areas where GM crops are sprayed with Roundup herbicide. GMWatch and Earth Open Source (which published the “Roundup and birth defects” report) initially raised these issues with UK and European politicians and retailers back in 2010. They met with the response that these were internal issues for the Argentine government and nothing to do with them. Some said that if things really were that bad, the Argentine government would “not allow” it to go on and regulators would step in and ban the cultivation of GMOs. So why does the Argentine government allow it to go on? Apart from the fact, that is, that the Argentine government receives 35% in taxes on GMO soy exports? The answer, as the Argentine journalist Dario Aranda explains in the exposé below, may be that the Argentine GMO regulator Conabia is stacked with people who have conflicts of interest with the GMO industry. People with links to Monsanto, Syngenta and Dow evaluate the safety of the GMOs submitted for approval by these exact same companies. This GMO company-regulatory nexus affects us all because the resulting GMOs end up in our food and livestock feed. In a particularly dangerous development, as Aranda notes, Conabia has been selected as a “reference center” for the Food and Agriculture Organisation of the United Nations (FAO). In this role Conabia will “provide technical and scientific advice” to the FAO regarding the “biosafety” of GMOs. So now we have people linked to the leading GMO developer companies, Monsanto, Syngenta, and Dow, telling the world’s major food security organization whether GMOs are safe. Perfect! UPDATE 2 March 2015: Maria Fernanda Foresto (ILSI connection in the article below) also worked for Monsanto for 3 years (you need a LinkedIn account to view her profile). She also worked on the ILSI Argentina project, “Development of construct based risk assessment criteria for GE crops“. The multinationals Monsanto, Bayer, Syngenta and Dow are a few of the companies that have a say in the approval of the GMOs that are driven by those same companies. We are talking about Conabia (Comisión Nacional Asesora de Biotecnología Agropecuaria, National Agricultural Biotechnology Advisory Committee), where “national” businesses (Biosidus and Don Mario) and business organizations also participate. “Independent researchers” are also a part of Conabia, but they have clear links to the companies. The government and companies publicize Conabia as “a pioneering forum with a solid and scientifically based regulatory framework.” Out of the 47 members, more than half (27) are employed by [pertenecen = belong to] the companies or have a clear link with the same companies that they must regulate. 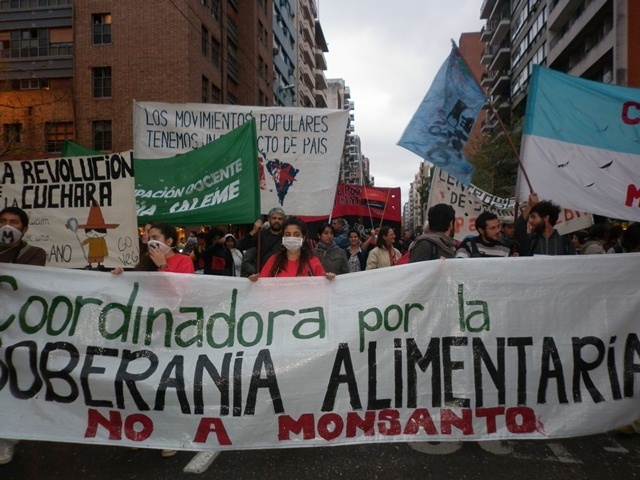 Conflicts of interest and complicities are present in the approval of GMOs in Argentina. According to official information, Conabia “analyzes and assesses the applications submitted in order to develop activities involving GMOs (genetically modified organisms – transgenics). Based on scientific and technical information and quantitative data regarding the biosafety of the GMO, it issues a ruling for the release or rejection of the corporate request. Two A4 sheets. A list of names, surnames and institutional affiliation. Although they are part of an official form, the information did not come from any government office (which hides the names), but from the private sector. There are 47 people on the list. It’s up to them, for the most part, to approve GMOs in Argentina. And paradoxically, 27 of them come from the same companies that drive the GMO model or are scientists with close links to those same companies. There are also 12 technicians and officers from Senasa (Servicio de Sanidad y Calidad Agroalimentaria, Food and Agriculture Quality and Health Service), Inase (Instituto Nacional de Semillas, National Seed Institute), and INTA (Instituto Nacional de Tecnología Agropecuaria, National Institute of Food and Agriculture Technology). All of them possess a rich background of collaboration with the private and GMO sector. Miguel Alvarez Arancedo is an agricultural engineer from UBA (Universidad de Buenos Aires). He participates in Conabia as part of Casafe (Cámara de Sanidad Agropecuaria y Fertilizantes, Office of Food, Agriculture and Fertilizer Security). His workplace address is Maipú 1210, Monsanto’s central office in Argentina. Arancedo is director of regulatory issues of the GMO multinational since 2004 and is also Vice President of the Semilleros Argentinos (Argentinian Seed Producers Association, ASA, a political meeting and lobbying association of multinational and local businesses). On March 2012, Arancedo celebrated the news that the new Monsanto soy (Intacta RR2 Pro) would begin to be planted shortly and referred to the system of the GMO’s release: “We were granted approval from Conabia, so we are in very good time. We think it could be available for producers next year (2013)”. Arancedo did not clarify that he himself participates in Conabia and the approval system. The national government authorized the soy variety in 2012. Juan Balbín is enrolled in Conabia as a representative of the Asociación Argentina de Consorcios Regionales de Experimentación Agrícola (Aacrea), an association of small and medium-sized agribusinesses. On May 2013 he was part of the official delegation to China (led by ex-Agricultural Minister and president of the House of Representatives, Julián Domínguez). Also participating in the trip were Pablo Vaquero (Monsanto´s president), Gastón Fernández Palma (president of Aapresid and vice-president of Maizar – an association of agribusinesses companies), Miguel Calvo (head of Acsoja – soy businesses) and Manuel Mihura, director of new business at Don Mario seeds, among others. The reason for the trip was to present the benefits of the Intacta soybean, which was yet not approved in China, and at the same time, to convince Chinese officials of the (alleged) advantages of GMO maize events. Also at Aacrea is Bernardo Debenedetti. The organization defines itself as an “association of food and agriculture businessmen who work together and share experiences and knowledge in order to raise profit and achieve sustainable economic growth of our businesses.” Debenedetti is also part of “Grupo Biotecnología” (Biotechnology Group) which meets in the Buenos Aires Grain Exchange, of which Casafe, Aapresid, Ciara (exporters), ASA, and Maizar are members, among others (in summary: all the businesses of the sector). One of its most publicized products was “the first cloned cow”, in 2002, named “Pampa.” Lino Barañao was involved in that initiative and always made public his work and his closeness to Biosidus (curious how his performance in the biotechnology company doesn’t figure on his CV). Andrés Bercovich is a biochemist from UBA (University Buenos Aires). He has worked for 23 years in Biosidus (since 2008 is Investigation and Development Manager) and also has a seat in Conabia. Bercovich was in charge of the calf cloning project called “Patagonia I, II, III and IV,” which was publicized as genetic material for deriving human insulin. The company’s advertisement promised that with 2500 similar cows they could supply insulin for the entire world. In 2010 he was part of the team that cloned the “first horse in Latin America,” called “Ñandubay Bicentenario.” It belonged to the Ñandubay breed, used for selected sports (polo and jumping). The Minister, Barañao, was present during the press conference. Without anyone asking, he announced, “Cloning does not pose any kind of risk to the animal’s health or the environment.” Daniel Salamone also participated in the cloned horse project; he also has links to Biosidus and is part of Conabia. Atilio Castagnaro is an expert at the Estación Experimental Agroindustrial Obispo Colombres (Experimental Station For Food and Agriculture Obispo Colombes), INTA Tucumán. In 2011 he was part of a team of scientists from Mercosur that created a robot that searched for the soy plants best adapted to resist droughts. “A great result of this project was being able to build a robot or automatic platform in order to mass-evaluate soy genotypes, regarding their capacity to tolerate a shortage of water, or drought,” Castagnaro said. Each day, the robot simultaneously goes over 120 potted soy plants, determines their water intake in order to give them the precise amount of water needed, and takes stereoscopic pictures in order to document their growth cycle. Two companies participated in the workgroup (and patenting): Nidera (one of the big agribusiness multinationals) and Indear (Instituto de Agrobiotecnología de Rosario, Agribiotechnology Institute of Rosario), a key forum for boosting GMOs. Indear, in turn, belongs to the Bioceres Company, in which Gustavo Grobocopatel ([whose family business is] one of the major seed sellers in the continent) and Víctor Trucco (honorary president of Aapresid) have positions. Castagnaro coordinates the project “Cadena Oleaginosa de Biotecsur (BiotecSojaSur, Oil Chain of Biotecsur), a forum promoted by the Science Ministry, where academics, state representatives, and, of course, agribusinesses converge. Castagnaro is an iron driver of GM sugarcane for agrofuels (a very unpopular initiative with peasant movements and social organizations due to its social and environmental effects). “The objective with GM sugarcane was to make production more efficient and sustainable; to provide economic, social and environmental sustainability and to drive a crop which is key in the production of biofuels,” summarized Atilio Castagnaro in a presentation given in the Aapresid Congress in 2013, held in Rosario; he proposed that 50 percent of the energy matrix of Argentina could be based on biofuels. Castagnaro said that there are the traditional sugar regions of Tucumán, Salta y Jujuy, with 550 thousand hectares of production. “There is a growth potential for the area close to 4.4 million hectares,” he said, and detailed the expansion of the agricultural border for GM sugarcane above Misiones and north of Santa Fe. The NGO asked itself how “the concern for human rights and the promotion of increased sales of agrotoxics can cohabit in the same individual”. It reminded him that the GM model monopolizes territory, and evicts and breaks apart indigenous and peasant people. “It is a contradiction to serve human rights and promote the spraying of large provincial territories,” Roque Vicente Pondal, from ProEco, said. Alongside Castagnaro works Bjorn Welin, who is also a part of Conabia. Ricardo Fernández de Ullibarri participates in Conabia on behalf of the Chacra Experimental Agrícola Santa Rosa (Experimental Agricultural Farm Santa Rosa) in Salta. The Chacra is the “research institute” of [agribusiness company] Ingenio Ledesma and is also a part of ASA (Asociación Semilleros Argentinos), to which all the big international corporations belong. “The main objective (of the Chacra) is to create varieties which improve productivity, competitiveness and profitability of the plantations of the north of Argentina,” highlights the company’s presentation. Fernández de Ullibarr is a proponent of GMOs. “We already have our own GMO sugarcane, but we have yet to release it commercially. All over the world they are working on that, but nobody has yet grown them commercially due to prejudice [against GMOs]. The slowest aspect is all the bureaucracy related to biosafety and legal norms, not the research itself,” complained Ullívarri in 2007. Permingeat, in his role at Conabia, must authorize or reject Monsanto´s requests. Diego Ferraro is an agricultural engineer and part of Conabia as representative of the Asociación Argentina de Ecología (AAE) (Argentinian Environmental Assosiation). It’ funny how no one in the socio-environmental movement, assemblies, NGOs and academic world knows the AAE even exists. The address for Asociación de Ecología is San Martín 4453. It is the same address as the Agricultural Faculty of UBA and also the address for the Instituto de Investigaciones Fisiológicas y Ecológicas (Ifeva, Physiological and Environmental Research Institute), a study area with explicit links to agribusinesses and a strong proponent of the agribusiness model. Ifeva’s director is Claudio Ghersa, a renowned GMO proponent who has co-authored scientific publications with Monsanto. Diego Ferraro Works at Ifeva alongside Ghersa and has co-authored half a dozen scientific publications. With the advance of herbicide-resistant weeds (one of agribusiness’s big unsolved problems), in February 2014 the Asociación Argentina de la Ciencia de las Malezas (Asacim, Argentinian Association of Weed Sciences) was re-launched. Among others, Ghersa and Ferraro are a part of it. And so are the companies. Among others: Aacrea and Aapresid. María Fernanda Foresto appears in Conabia as an expert at the Chacra Experimental Agrícola Santa Rosa (del Ingenio Ledesma). But there is another conflict of interest. Foresto is part of the Comité de Biotecnología (Biotechnology Commitee) of ILSI (Instituto Internacional de Ciencias de la Vida, International Life Sciences Institute), one of the big international scientific lobbying firms for GMOs. ILSI is sponsored and funded by Monsanto, Dow Agrosciences, Bayer and Syngenta. Dalia Marcela Lewi works for the Genetics Institute of INTA and is a member of Conabia. In the book “Biotecnología y mejoramiento vegetal II” (Biotechnology and Plant Breeding II), Chapter X, she writes an academic text called “Aplicaciones de la biotecnología en el control de insectos” (“biotechnology applications for insect control”). It highlights the benefits of GMOs in biological control, reducing pesticides, improving yields and, as if that were not enough, it also highlights the decreased use of water. Lewi co-authored the article with Clara Rubinstein, from Monsanto Argentina. She also researched, with the company Bioceres (another agribusiness expert),the resistance of GM maize to cold and salinity. Lewi is also a part of the Biotechnology Commitee of ILSI, alongside researchers from Monsanto, Syngenta, Bayer, and Dow Agrosciences. Dalia Ewi signed the article as “member of Conabia.” She omitted her links to GMO companies. Teresita Martín appears in Conabia as a representative of the Foro Argentino de Bioteconología (Argentinian Forum on Biotehnology). It does not specify that she is an expert at DuPont Pioneer. Luis Negruchi (Aapresid) and Alejandro Petek (Aapresid) also participate (and decide) in Conabia. Guillermo Mentruyt signs [in Conabia] as a member of ASA (seed producers), does not clarify that he is manager of regulatory issues at Dow AgroSciences. He omitted that Syngenta itself is part of the Commission [Conabia]. Lucas Lieber is a graduate from the Faculty of Agrarian Sciences at the University of Rosario. His CV details his work in Indear and Bioceres. He is also a member of Conabia. The biologist Magdalena Sosa Beláustegui appears [in Conabia] as part of Casafe. She is also, since 2004, part of the multinational Bayer. In her CV, she highlights that in 2013 she received the Bayer Award for Innovation in Regulatory Issues. Fernando Bravo Almonacid (Conicet) is a researcher “independent from Conicet at Instituto de Investigaciones en Ingeniería Genética y Biología Molecular (Institute for Research on Genetic Engineering and Molecular Biology, Ingebi-UBA) and works on the genetic improvement of the potato. After six years of work, in 2013, he produced a new variety, which will be more resistant to viruses. Everything related to Conabia’s approval was left in charge of the Tecnoplant company (belonging to Grupo Sidus). Almonacid is also part of Conabia. Listed as “observers” in Conabia are two members of the Cámara Argentina de Biotecnología (Argentinian Chamber on Biotechnology). Gerónimo Watson (who for nine years has held the position of “development leader” at Indear) and Mirta Antongiovanni (regulatory issues manager of the seed company Don Mario). Eduardo Pagano is an agronomist with a biological sciences doctorate and was, until March of last year, vice-dean of the Faculty of Agronomy at UBA. He is also a member of Conabia and is a professor in charge of the Cátedra de Bioquímica de Agronomía (Department of Biochemistry of Agronomy) at UBA. From this position, he works along seed company Don Mario (one of the biggest Argentinian companies of the sector) in wheat and soy crops. “We chose to associate with Don Mario because it is a national company which commits to development of human resources and because this relationship offers us a concrete possibility of transferring the knowledge we generate, and to reach a productive environment through our research,” said Eduardo Pagano. The director of Research at Don Mario, Marcos Quiroga, also celebrated the joint work: “We generate technology which serves to give concrete solutions to some very important problems of soybean cultivation in Argentina, USA and Brazil,” he explained. Pagano never declared his conflicts of interests in order to approve GMOs as a member of Conabia. Since the approval of the RR soybean in 1996, Conabia´s performance was always the target of complaints by social and scientific organizations with no links to the private sector. Governments always played down the corporate influence but always hid the member payroll list and have never explained the way in which the Commission worked. Neither have they made public the system of approvals for company applications. The Centro de Estudios Legales del Medio Ambiente (Celma, Center for Environmental Legal Studies) denounced in 2013 before the Federal Justice the “irregular” way in which Monsanto’s soybean “Intacta RR2” was approved in 2012. They questioned the non-existence of public consultation (as Argentinian law demands), the lack of a proper environmental safety assessment study, and the omission of the substantial scientific bibliography about the negative health and environmental effects of GMOs. The Celma agreed to the administrative record of approval for Monsanto’s soy, complained that the approved seed “does not possess a proper environmental impact statement” from Conabia, and explained that the approval “is based solely on studies conducted by Monsanto.” The State did not perform any study. Fernando Cabaleiro, of Celma, questioned the role of Conabia and Senasa (Servicio de Sanidad y Calidad Agroalimentaria, Health and Food Quality Service). “It is based solely and exclusively on studies conducted by the applicant itself, Monsanto. There are no comments or questions about the work presented by the company,” the lawyer declared and showed the Sheet 37 decision document, with which Conabia approved the new soybean. Eleven doodled signatures are shown, without any clarification of names, areas of expertise or positions. “It could have been anyone. The impunity with which they gave the green light to a seed that will be planted over millions of hectares is unbelievable,” the lawyer said. Conabia has approved more than 30 GMO events (maize, soy and cotton), but refuses to make public the records of approval. The CTA newspaper called Conabia’s executive secretary and director of Biotechnology of the Agriculture Ministry, Martín Lema. But he did not return the phone calls. On October 31 last year, the Agriculture Ministry sent out an eloquent press release, titled “The work of Argentinian biotechnology is recognized by the FAO” (UN Food and Agriculture Organization). It celebrated the fact that Conabia had been selected as a “reference center” for the FAO regarding the “biosafety” of GMOs. Conabia will now “provide technical and scientific advice” to the FAO. English translation of Spanish original: Ignacia Guzmán Zuloaga. Editing: Claire Robinson. NOTE: This is a volunteer and non-professional translation which is offered to GMWatch readers as a service. If accuracy is important to you, please consult the Spanish original. Is Bolivia going to frack ‘Mother Earth’?